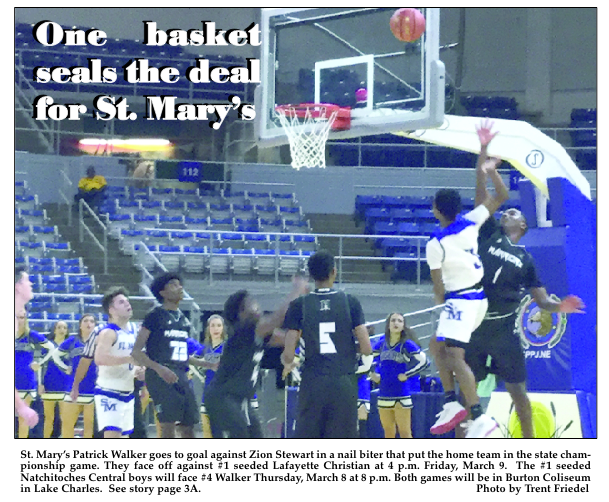 Saint Mary’s Tigers took on the Hamilton Christian Warriors in the semifinal game to determine the State Championship match up in Division IV. Earlier action had the defending state champion Lafayette Christian Knights defeating the Southern Lab Kittens in a game that had Southern lab leading until the waning minutes of the fourth quarter. The Knights will make it to their second championship game in a row but who will they face? Thirty-two minutes of action at the Burton Coliseum answered that question Monday night. The matchup had the 22-9 third seed Warriors facing the number two seed Saint Mary’s Tigers. Action for this semi-final game was nothing short of electric. The Warriors get the tip to start the game and immediately go to work against the Tigers. #4 Reggie Jackson scores for the Warriors on a nice mid-range jump shot. It would take the Tigers almost 3 minutes of game time before Bailey Shelton sinks a three to make the score 4-3 in favor of Hamilton Christian. Walter Withers gets called for two early fouls, but the Warriors settle into their half-court offense and pull out a 12-6 lead by the 3:32 mark. Shelton sinks another three with 2:22 in the first to get the Tigers within three. Zion Stewart has an answer for that with his own 3-ball and the Warriors lead by six. Saint Mary’s closes the gap to four in the last minute of first quarter action, but it is evident that they are trying to get back in transition after shots and not going for offensive boards. Warriors lead 15-11 at the end of one and the Tigers have given up six second-chance points to the Warriors who keep cleaning up offensive boards. Thomas Howell starts the scoring in the second period on an easy layup off the assist from Parker Bankston. Dakori Lewis answers with his own layup, Shelton misses a three and the Warriors can’t make a field goal from the floor. On the rebound, Shelton hits Howell in the paint and the big man throws downs a two-handed jam to bring the Tigers to within two, 17-15. Adrian Brown quiets the Tiger fans with a 3 after that. Howell is not dissuaded though, and he goes the distance of the court on the next rebound and finger rolls in another two points. He then goes to work swatting Warrior shot attempts. He blocks two on the same possession. Bankston nails a three with 2:09 before halftime and the score stands at 22-20 Warriors with the lead. Howell is fouled by Whithers with 1:10 showing on the clock and he can tie the game at the free throw line. He successfully sinks both attempts and the Tigers have knotted the score at 22. Shelton gets a steal with 52 seconds on the clock and gets the ball into the front court to Jared Elie who can’t make a layup to give the Tigers a lead. Bankston misses a three and the Warriors score on a layup by Lewis as time expires in the first half of play. The Warriors hold a two-point advantage 24-22 and are shooting 34 percent from the field. Saint Mary’s is only at 28 percent from the floor and an anemic 25 percent from beyond the arch. The second half opens with Hamilton Christian with the ball. They get the ball in to Z. Stewart who makes the easy layup. Bankston turns the ball over on the ensuing possession. Hamilton Christian extends their lead to five by the half way point of the third quarter. Patrick Walker is making a difference coming off the bench for the Tigers. Saint Mary’s begins to go cold shooting and the Warriors pull ahead by as many as 10 with 1:16 on the clock. The Warrior lead is 38-28 as they try to run the clock down. Bankston connects on a 3-ball to trim the lead, but Hamilton Christian again scores in the last 8 seconds of the quarter to take a 40-31 advantage over Saint Mary’s after three periods have expired. Z. Stewart opens the fourth quarter with a 3-point shot for the Warriors and their lead has grown to 12 points. It would be the largest lead of the game and a seemingly insurmountable deficit by most accounts. But we have grown accustomed to a Tiger team with heart and tenacity. Hold on ladies and gentlemen, here come the Tigers! The score is 45-33 with 6:56 in regulation after a score by Reggie Jackson. Bankston misses a three and the Warriors have the ball before Shelton steals it back. Bankston attempts another three that is no good and he fouls Stewart on the rebound. The next play has Dakori Lewis miss a layup and Howell has the rebound. He dishes the ball out to Pat Walker and he returns favor by getting the ball to Howell down low who slams it home. It’s the spark that starts the run for the Tigers. The Warriors inbound and Lewis travels turning the ball over to the Tigers. Elie gets the layup to fall and the Warrior lead is eight, 45-37. The ensuing inbounds has the same results as Michael Thomas commits a carry violation and the ball is back in the hands of the Tigers with 5:35 to go. The Tigers have a missed shot then steal the ball twice on the follow-on plays, once by Howell and once by Bankston. The steal by Bankston allows him to score a layup and the deficit is down to six, 45-39 with 4:41 and a timeout is called. Tigers go to the full court press against the opposition. The Warriors Brown misses a jumper and they get the offensive board but then get stripped by Bankston. He gets the ball ahead to Howell for the easy layup, 45-41 with 4:03 of clock and A FOUR POINT GAME. Michael Thomas gets his pocket picked by Howell who gets it into the front court to Elie who goes for the rim and gets called for the charge against Thomas. Tigers turn over the ball. Michael Thomas goes right hand dribble to the lane and Elie is called for the blocking foul. Are you kidding me? Thomas can only sink the front end of the one and one, 46-41 with 3:03. As unlikely as it is the Warriors get the offensive rebound but Howell swats the shot attempt that is gathered in by Jackson who turns the ball over. Bankston drains a corner three and the Tigers are within two, 46-44 in favor of the Warriors. Hamilton Christian misses a jump shot that is rebounded by Bankston. He gets it to Howell who drains the jump shot and we are tied at 46 with 1:58 showing on the clock. If you are keeping count that is a 13-1 run by the Tigers since the 6:56 mark. Enter in the longest 1 minute and 58 seconds of basketball in Saint Mary’s history. Michael Thomas gets a layup to fall over Howell and the Warriors lead by two 48-46. Bankston no good from beyond the arch and Warriors get the rebound then fouled by Shelton. Brown misses the free throw and Tigers have the ball. Elie takes it to the hole and gets fouled as the ball kisses the glass and falls true. Here is a chance for the old fashioned 3-point play and the first lead of the game. The senior is clutch at the line and Saint Mary’s has their first lead of the game 49-48 with 1:08 on the clock. The Warriors get the ball in and get called for a carry on intense pressure from the Tigers. The Tigers inbound to P. Walker. He goes to the goal and gets fouled on the attempt. That sends him to the free throw line and he doesn’t disappoint. Walker drains both hitting nothing by nylon and gives his team a 51-48 lead. Howell fouls Jackson who makes his charity points with the clock stopped and closes the gap to a one point, 51-50 Tigers lead. There is under a minute remaining. The Tigers inbound the ball and Shelton is fouled but it is only the sixth team foul on the Warriors. Forty-eight seconds and Howell turns the ball over but not for long as Shelton steals it back then makes a layup to make the score 53-50 with a mere 33 seconds in the way of a possible State Championship berth. The Warriors will not go down without a fight. They get the ball inbounds and Elie commits a foul sending Michael Thomas to the line. He is true on both shots and the score is 53-52 Saint Mary’s. Only 25 seconds folks, only 25 seconds and possession of the ball. Elie is fouled by Lewis and he will go to the free throw line for the one and one. The first free throw is good, but the second misses its mark and the Warriors have life. The score is 54-52 and the Warriors only need two to tie and three to win with 23 seconds on a clock that ticks with frozen agony for the Tiger faithful. Warriors get the ball into the front court and Z. Stewart launches a three. It misses the mark, but the Warriors get the offensive rebound. Tick tock, 12 seconds on the clock. Shot by Jackson, no good. Tick of clock, rebound Z. Stewart three-tenths of a second. Jump shot Stewart BLOCKED by Howell. Final clock tock registers and the horn sounds as Tigers win 54-52. The Tigers would be out rebounded 45-25, they gave up 11 second chance points. Saint Mary’s only shot 23 percent from 3-point land and trailed for 29 minutes. But the Tigers shot 83 percent from the free throw line. They did lead when it counted and Howell was stellar in the second half. The big man had 21 points, 13 rebounds, 8 blocked shots and 2 dunks. Patrick Walker came off the bench to play 23 minutes and make points when it counted. Bailey Shelton continues to be a ball hawk on defense and Jared Elie runs the offense with authority. Parker Bankston is likely to shoot a three at anytime or just as easily drive the lane. This team was tested but prevailed through adversity. Aaron Howell and Thomas Howell remarked, “It’s a surreal feeling playing for a State Championship. It is a dream come true. Something we’ve been dreaming of our whole lives and now to actually do it, man it’s great.” The Saint Mary Tigers advance to play the number one seed Lafayette Christian, the defending Division IV Champion. The winner takes all. Game will be Friday at 4 p.m. This is the first trip to a finals game in basketball for Saint Mary’s since 1960.